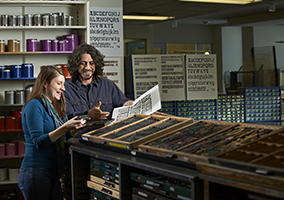 Since 1998, the Book Arts Program has provided hands-on education in art, history, cultural studies, and literacy appreciation to Utah's school children and educators. As current resources allow, many events are offered at no cost to participants, and programming seeks to serve audiences with greater need and fewer educational opportunities. Through K–12 outreach initiatives, the Program makes classroom visits and hosts workshops, celebrating the innovation, collaboration, and excitement for learning that come from expressing ideas through creative, hands-on experience. Educator-specific workshops provide teachers with ideas for cross-disciplinary lessons and bookmaking techniques to integrate into K-12 curricula. Through these free, grant-supported workshops, the Program strives to deliver a variety of bookmaking instruction suitable for teachers and students of all grade levels and abilities. We offer a 2-day intensive every summer and teach half-day workshops for teachers throughout the year. If you are interested in hosting a professional development workshop for your district or school, please get in touch! If you are interested in receiving our K-12 Bookmaking Newsletter, please subscribe here. We send out a newsletter every six weeks with information on upcoming workshops for teachers, ideas for integrating bookmaking into your classroom, and more. As funding allows, our program offers scholarships to active K-12 educators in many of our community workshops and non-credit courses. Please visit our workshops page to view upcoming courses, application deadlines, and links to apply listed next to each workshop where K-12 scholarships are offered. Limited scholarships cover tuition and supplies and are awarded to randomly selected teachers who apply by the deadline. Teachers may receive no more than one scholarship per school year.